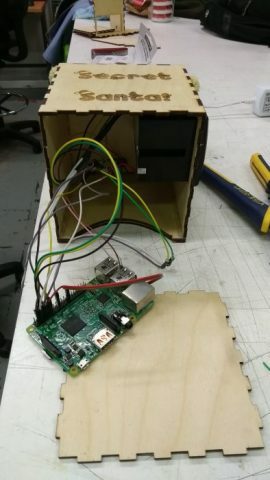 Babbage Bear Secret Santa from Pi Towers @Raspberry_Pi #PiDay #RaspberryPi « Adafruit Industries – Makers, hackers, artists, designers and engineers! Tired of pulling names out of a hat for office Secret Santa? 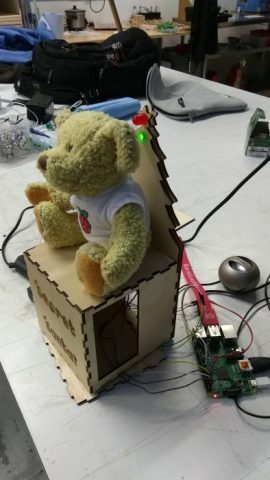 Upgrade your festive tradition with a Raspberry Pi, thermal printer, and everybody’s favourite microcomputer mascot, Babbage Bear. It’s that time of year again, when the cosiness gets turned up to 11 and everyone starts thinking about jolly fat men, reindeer, toys, and benevolent home invasion. At Raspberry Pi, we’re running a Secret Santa pool: everyone buys a gift for someone else in the office. Obviously, the person you buy for has to be picked in secret and at random, or the whole thing wouldn’t work. With that in mind, I created Secret Santa Babbage to do the somewhat mundane task of choosing gift recipients. This could’ve just been done with some names in a hat, but we’re Raspberry Pi! If we don’t make a Python-based Babbage robot wearing a jaunty hat and programmed to spread Christmas cheer, who will? The script the robot runs is pretty basic: a list of names entered as comma-separated strings is shuffled at the press of a GPIO button, then a name is popped off the end and stored as a variable. The name is matched to a photo of the person stored on the Raspberry Pi, and a thermal printer pinched from Alex’s super awesome PastyCam (blog post forthcoming, maybe) prints out the picture and name of the person you will need to shower with gifts at the Christmas party. (Well, OK — with one gift. No more than five quid’s worth. Nothing untoward.) There’s also a redo function, just in case you pick yourself: press another button and the last picked name — still stored as a variable — is appended to the list again, which is shuffled once more, and a new name is popped off the end.